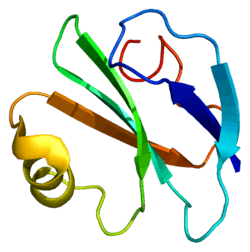 CD59 glycoprotein also known as MAC-inhibitory protein (MAC-IP), membrane inhibitor of reactive lysis (MIRL), or protectin, is a protein that in humans is encoded by the CD59 gene. It belongs to the LY6/uPAR/alpha-neurotoxin protein family. CD59 attaches to host cells via a glycophosphatidylinositol (GPI) anchor. When complement activation leads to deposition of C5b678 on host cells, CD59 can prevent C9 from polymerizing and forming the complement membrane attack complex. It may also signal the cell to perform active measures such as endocytosis of the CD59-CD9 complex. Mutations affecting GPI that reduce expression of CD59 and decay-accelerating factor on red blood cells result in paroxysmal nocturnal hemoglobinuria. Viruses such as HIV, human cytomegalovirus and vaccinia incorporate host cell CD59 into their own viral envelope to prevent lysis by complement. ↑ "Entrez Gene: CD59 molecule, complement regulatory protein". 1 2 Maio M, Brasoveanu LI, Coral S, Sigalotti L, Lamaj E, Gasparollo A, Visintin A, Altomonte M, Fonsatti E (Aug 1998). "Structure, distribution, and functional role of protectin (CD59) in complement-susceptibility and in immunotherapy of human malignancies (Review)". international journal of oncology. 13 (2): 305–18. doi:10.3892/ijo.13.2.305. PMID 9664126. ↑ Huang Y, Qiao F, Abagyan R, Hazard S, Tomlinson S (September 2006). "Defining the CD59-C9 binding interaction". J. Biol. Chem. 281 (37): 27398–27404. doi:10.1074/jbc.M603690200. PMID 16844690. ↑ Bohana-Kashtan O, Ziporen L, Donin N, Kraus S, Fishelson Z (July 2004). "Cell signals transduced by complement". Mol. Immunol. 41 (6–7): 583–597. doi:10.1016/j.molimm.2004.04.007. PMID 15219997. Tandon N, Morgan BP, Weetman AP (1992). "Expression and function of membrane attack complex inhibitory proteins on thyroid follicular cells". Immunology. 75 (2): 372–7. PMC 1384722 . PMID 1372592. Holmes CH, Simpson KL, Okada H, et al. (1992). "Complement regulatory proteins at the feto-maternal interface during human placental development: distribution of CD59 by comparison with membrane cofactor protein (CD46) and decay accelerating factor (CD55)". Eur. J. Immunol. 22 (6): 1579–1585. doi:10.1002/eji.1830220635. PMID 1376264. Hahn WC, Menu E, Bothwell AL, et al. (1992). "Overlapping but nonidentical binding sites on CD2 for CD58 and a second ligand CD59". Science. 256 (5065): 1805–1807. doi:10.1126/science.1377404. PMID 1377404. Ninomiya H, Sims PJ (1992). "The human complement regulatory protein CD59 binds to the alpha-chain of C8 and to the "b"domain of C9". J. Biol. Chem. 267 (19): 13675–80. PMID 1377690. Petranka JG, Fleenor DE, Sykes K, et al. (1992). "Structure of the CD59-encoding gene: further evidence of a relationship to murine lymphocyte antigen Ly-6 protein". Proc. Natl. Acad. Sci. U.S.A. 89 (17): 7876–7879. doi:10.1073/pnas.89.17.7876. PMC 49817 . PMID 1381503. Motoyama N, Okada N, Yamashina M, Okada H (1992). "Paroxysmal nocturnal hemoglobinuria due to hereditary nucleotide deletion in the HRF20 (CD59) gene". Eur. J. Immunol. 22 (10): 2669–2673. doi:10.1002/eji.1830221029. PMID 1382994. Rooney IA, Morgan BP (1992). "Characterization of the membrane attack complex inhibitory protein CD59 antigen on human amniotic cells and in amniotic fluid". Immunology. 76 (4): 541–7. PMC 1421564 . PMID 1383132. Tone M, Walsh LA, Waldmann H (1992). "Gene structure of human CD59 and demonstration that discrete mRNAs are generated by alternative polyadenylation". J. Mol. Biol. 227 (3): 971–976. doi:10.1016/0022-2836(92)90239-G. PMID 1383553. Philbrick WM, Palfree RG, Maher SE, et al. (1990). "The CD59 antigen is a structural homologue of murine Ly-6 antigens but lacks interferon inducibility". Eur. J. Immunol. 20 (1): 87–92. doi:10.1002/eji.1830200113. PMID 1689664. Sawada R, Ohashi K, Anaguchi H, et al. (1990). "Isolation and expression of the full-length cDNA encoding CD59 antigen of human lymphocytes". DNA Cell Biol. 9 (3): 213–220. doi:10.1089/dna.1990.9.213. PMID 1692709. Yamashina M, Ueda E, Kinoshita T, et al. (1990). "Inherited complete deficiency of 20-kilodalton homologous restriction factor (CD59) as a cause of paroxysmal nocturnal hemoglobinuria". N. Engl. J. Med. 323 (17): 1184–1189. doi:10.1056/NEJM199010253231707. PMID 1699124. Rooney IA, Morgan BP (1991). "Protection of human amniotic epithelial cells (HAEC) from complement-mediated lysis: expression on the cells of three complement inhibitory membrane proteins". Immunology. 71 (3): 308–11. PMC 1384423 . PMID 1702747. Watts MJ, Dankert JR, Morgan EP (1990). "Isolation and characterization of a membrane-attack-complex-inhibiting protein present in human serum and other biological fluids". Biochem. J. 265 (2): 471–7. PMC 1136908 . PMID 2302178. Okada H, Nagami Y, Takahashi K, et al. (1989). "20 KDa homologous restriction factor of complement resembles T cell activating protein". Biochem. Biophys. Res. Commun. 162 (3): 1553–1559. doi:10.1016/0006-291X(89)90852-8. PMID 2475111. Davies A, Simmons DL, Hale G, et al. (1989). "CD59, an LY-6-like protein expressed in human lymphoid cells, regulates the action of the complement membrane attack complex on homologous cells". J. Exp. Med. 170 (3): 637–654. doi:10.1084/jem.170.3.637. PMC 2189447 . PMID 2475570. Sawada R, Ohashi K, Okano K, et al. (1989). "Complementary DNA sequence and deduced peptide sequence for CD59/MEM-43 antigen, the human homologue of murine lymphocyte antigen Ly-6C". Nucleic Acids Res. 17 (16): 6728–6728. doi:10.1093/nar/17.16.6728. PMC 318369 . PMID 2476718. Sugita Y, Tobe T, Oda E, et al. (1990). "Molecular cloning and characterization of MACIF, an inhibitor of membrane channel formation of complement". J. Biochem. 106 (4): 555–7. PMID 2606909. Bora NS, Gobleman CL, Atkinson JP, et al. (1994). "Differential expression of the complement regulatory proteins in the human eye". Invest. Ophthalmol. Vis. Sci. 34 (13): 3579–84. PMID 7505007. Kieffer B, Driscoll PC, Campbell ID, et al. (1994). "Three-dimensional solution structure of the extracellular region of the complement regulatory protein CD59, a new cell-surface protein domain related to snake venom neurotoxins". Biochemistry. 33 (15): 4471–4482. doi:10.1021/bi00181a006. PMID 7512825. Kennedy SP, Rollins SA, Burton WV, et al. (1994). "Protection of porcine aortic endothelial cells from complement-mediated cell lysis and activation by recombinant human CD59". Transplantation. 57 (10): 1494–501. doi:10.1097/00007890-199405000-00017. PMID 7515200.